This interview took place on: February 19, 2012. JFH (John DiBiase): What lead to the demise of "LaRue?" Natalie LaRue: Haha, the word "demise" sounds so dramatic! It was much more gradual than that actually. Phil and I had been doing music together for a while. Then we met, fell in love, and got married to our spouses in the same year as each other! What started out as, "Let's take a break for a bit," which turned into "maybe this season is done." It really felt like the Lord released us from what we felt like we had been called to do. It was the closing of one chapter for the beginning of another. JFH (John): What did you do immediately after the folding of "LaRue"? Natalie: That being said, the choice to end LaRue was done by a mutual peace and understanding from both of us. I think we did our last show about two months before I got married. After that I packed my stuff up and moved back out to California (where we originally hail from) where my fiancé had a job as a youth pastor. We got married and both dived head first into youth ministry. JFH (John): And What have you been up to since then? Natalie: Since then it's been a whirlwind! My husband and I will be married 9 years this summer-our son, our first baby was "unplanned" pretty shortly after we were married... That threw me into the world of motherhood a lot sooner than I had expected. Now we have three beautiful kids. My youngest is just 8 months, so you can say that I have been busy! JFH (John): What inspired you to get back into music? Natalie: Honestly, there are two parts to my journey. The music and then the song writing. Writing songs was something that never stopped for me. So much of the most pivotal parts of my life have been the most recent, so as I walked through the biggest transitions, songs came out naturally... They were just sung in my upstairs closet. The other part of my journey was the music part... I will have to say that part of me had to completely die in order for me to fully take on the role God had placed on my life. To be a wife, mother and homemaker. That isn't the case for everyone, but for me, that's what my personal journey had to be. Now I feel ready and able to resurrect that part of me, with the assurance of who I am now. It gives me a platform I believe of sharing about the things I am passionate about. JFH (John): What do you hope to do musically that maybe you've never been able to do before? Natalie: Musically speaking; I have never really gotten the chance to have all the songs be sung from just my perspective and style. We always found a great middle ground in LaRue, but Phillip and I have always had our own unique flavors, if that makes any sense. So these songs are really mine, just mine, and that is a first for me to have them recorded. JFH (John): Have you done any writing or recording (or plan to)? With Phillip lately? Natalie: To be honest no, actually! My brother is a very busy man, and has gotten quite successful in the world of songwriting, I am so proud of him! We are big supporters of each other. We are still very close and both have families now, and spend loads of time with each other. I would love to sit down and write with him in the future, but our personal relationship always comes first. So we'll see, who knows? JFH (John): You recently shared with your Kickstarter supporters a story that was a glimpse of what working on music while being a full-time mother is like. Has it been difficult to revisit that [music-making] season of your life as a new chapter? Has it been surprisingly easy or more difficult? Natalie: In some ways, it is so crazy that I'm not sure I am up for the challenge! It's felt like pulling teeth each step of the way....I mentioned that I had to let my former music self "die," well it has been slow and steady to bring it back to life. But I have the most amazing partner/support by my side, my husband. He has been the one to push me forward in this when I was hesitant. He is the one who helps make it a priority as a family that I take time to focus, have meetings, practice, etc. I can't imagine finding the strength on my own; I am so thankful for who he is. JFH (John): What artists have been inspiring your current musical direction? Natalie: That's a tough one... I am not sure, really. I love "beautiful" music... Soaring melodies, delicate piano, etc. And yet, I've got this passion for raw sounding edgy rock. That is why I am thankful for Don Chaffer, who is going to produce this. He has been the other half to my puzzle that I have been looking for to help me make sense. JFH (John): Including Don, have you been working with any other writers, artists or producers for this project? Natalie: Don Chaffer from Waterdeep is going to produce it. I am a HUGE fan of him (and his wife Lori, for that matter) as a writer, musician and producer; so it is an honor. There might be a song or two co-written with him and a couple friends of mine who have and will continue to help steer me in the right direction when I get stuck in a rut. JFH (John): Can you tell us about some of the songs you have been writing -- musically and thematically? Natalie The songs I have been writing are very much appropriated to the specific season I am in and have been at the last little while. There is something so significant about these seasons of life... Growing up, falling in love, becoming a spouse and parent. The mountains high, valleys low, yet in the midst of it all experiencing the continual graceful dialogue with the Lord. JFH (John): Any plans to start performing some shows in the near future? Natalie: Maybe, who knows? I know I would like to for sure, but it will have to be more intentional than before. Natalie: He has been teaching me the amazing gift of gratitude, in the right-now, the good and bad, the ugly and the beautiful, the significant, and the menial. If I can see HIM in all these things, and what's more I can praise Him, then I can know real joy and peace in my life. And so, I will push and strive, and fail, but Grace is my companion. 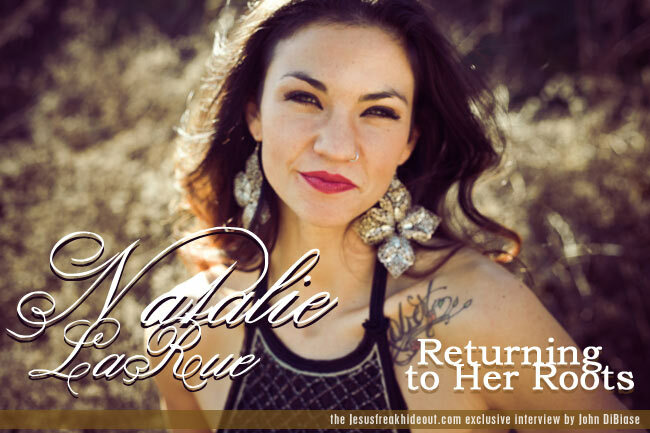 You can help fund Natalie LaRue's debut solo project on Kickstarter right now!